Custom Earth Promos is the best of the best. What they do for the industry is great. Eco-friendly and reusable products for an amazing price. Really unique promotional messenger eco bags. They are very compact with a spacious amount of interior room. Thank you Custom Earth Promos. The logo you guys customized and placed on this bag for me looks outstanding. Really stands out on the bag. Will be referring your company to everyone I know. These bags were a huge hit at my last trade show. Thank you for the business CEP. CEP really has some unique products. This promotional bag was really the perfect fit for my business. Really appreciate the eco-friendly and reusable attribute. Custom Earth Promos really met my necessary needs. Love how simple yet versatile this bag is! Definitely recommend! Custom Earth Promos is a top notch company and always recommend them to company owners. These were a huge hit at our affiliate summit! Loved this product. Really made life easier. Couldn't be happier with my order. Ill be placing another one soon. Would never go another route when ordering my eco-friendly products. Stay organized and be comfortable with this messenger sling bag. Glad I dealt with this company. They really made life easy when it came to placing a large order of messenger sling bags. Ordered 5,000 of the messenger sling bags. Everyone one was of the same great quality. Such a great product to have accessible. I can have all my necessary items it at my disposable, just very convenient for someone constantly on the go. Nice color options. My logo really stood out on this messenger sling bag. I manage several warehouses with several hundred employees. We customized messenger sling bags with our logo on it and handed them out to all the workers. Great idea. A cut above the rest when it comes to customer service. Thank you so much. Our newest eco-friendly promotional product will be your company’s new favorite messenger show bag! 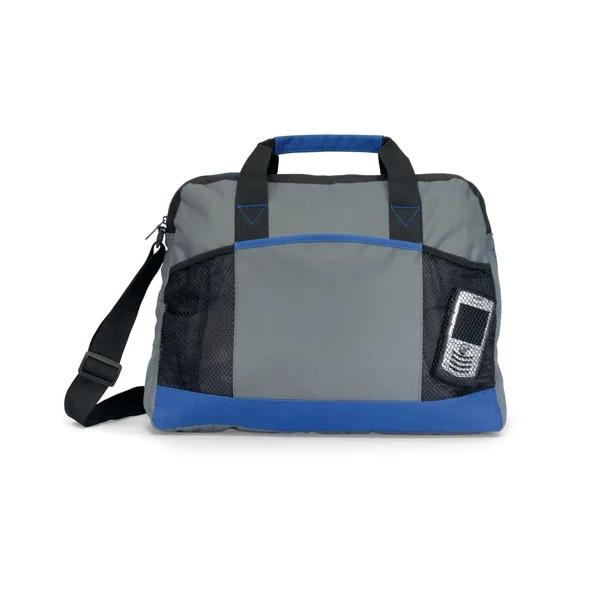 The Reusable Promo Messenger Bag is perfect for your business to reach a new target market! Your customers will enjoy a reliable product with useful features and a fashionable appeal! With the durability of the polyester bag, your company will definitely benefit and see a rise in incoming clientele! Our bag features a kid-friendly design that is perfect for toting around daily necessities. This could be for work, school, or any other errand. In four unique color options, Black, Kiwi, Red and Royal Blue, you are able to pick a color that reflects your brand! 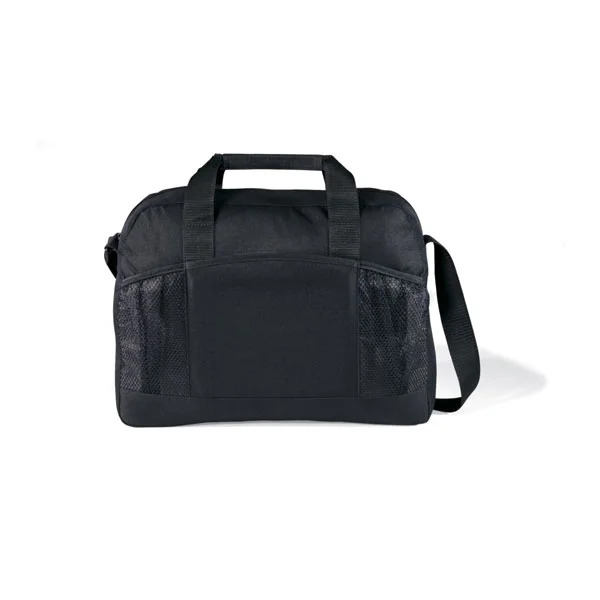 The 16"L x 12"H x 3.5"W bag size allows for max usage and the ability to carry your most important belongings. Your brand logo will be covering the bag! Find yourself printing your business logo on our new messenger bag! 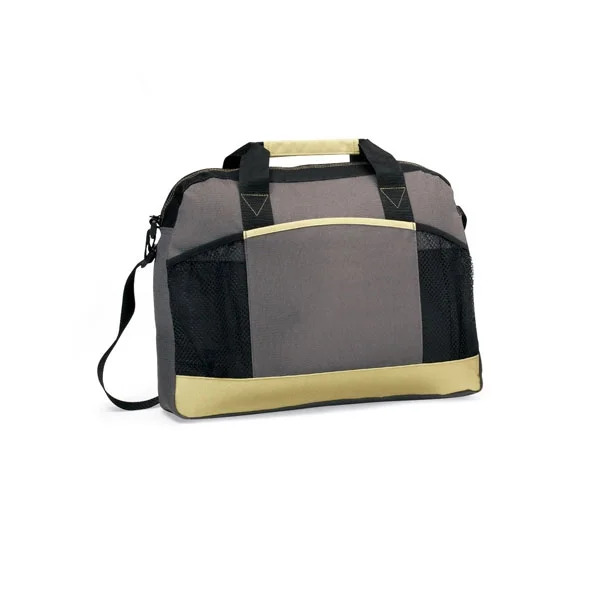 Your customers will be able to use the bag for everything they can think of, with a large main compartment and front slash pocket for smaller items. The long lasting bag will prove to be a relic of the reliability of your company! At Custom Earth Promos, we pride ourselves on providing the best customer service possible to our clients! Use our virtual spec forum to customize your bag to your content. You’ll be able to make your individual product stand out from your competitors. Pick from a range of color and imprint options, and let your business shine through your branding!